Several miles down a twisty road to Fernvale off Highway 96 between Franklin and Highway 100 there is a beautiful little white church (in the vale). I admit to exceeding the speed limit a little riding with the top down in my Miata to the rehearsal the day before the wedding of Allison and Patrick which took place on October 12, 2013. Allison chose traditional classics for their ceremony and prelude with the exception of “Por Una Cabeza” during prelude, that sensuous, dramatic tango from the tango scene in “Scent of a Woman”. I understood that choice perfectly as it’s one of my all time favorite pieces of music. Allison was relaxed and down to earth…a joy to work with. Congratulations to Allison and Patrick and their families. May they have many wonderful years together. On Sunday, October 6, 2013, we found our way to Madisonville, KY to Ruby Lodge, a stunningly beautiful location overlooking a tree lined lake. There we presided over the music for the wedding of Emily and Ryan. When we arrived the rain started coming down steadily making it impossible for us to set up where the guests were to sit. Fortunately there was a tent set up just behind the guests and we were able to raise the tent side and safely play under cover. However all turned out very nicely as the rain stopped shortly before the ceremony and the sun shone brightly. 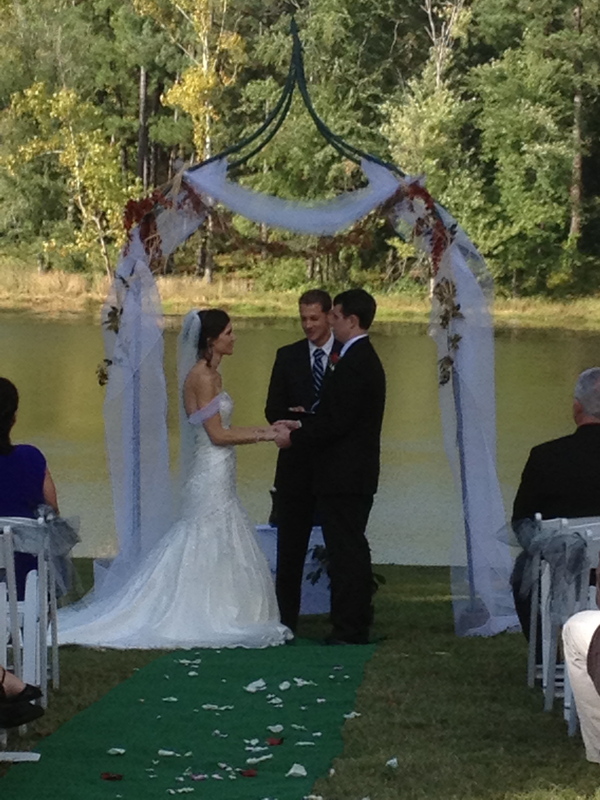 Another plus for us was our view of the bride and groom with the lake as the backdrop. Emily chose a mix of hymns and contemporary songs for the prelude and processionals. Mothers processed to “Secret Wedding” (Braveheart). The wedding party processed to “Only Hope” (A Walk to Remember) with the bride waiting for a particular part of that song to make her entrance (“singing with all that I am at the top of my lungs”). Sister, Anna, did a beautiful job of singing “One Hand, One Heart” for a tree grafting unity ceremony. I laughed out loud when Emily wrote that they would be doing some “light gardening” for their unity ceremony…and indeed they did. They recessed to “Sweet Home Alabama” (one or both of them being an Alabama fan – Roll Tide!). 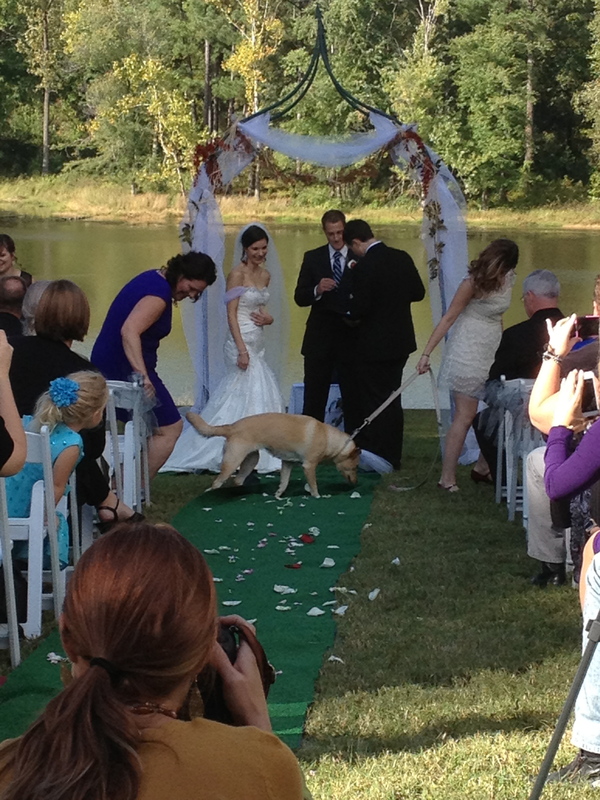 Oh, and another fun part of their ceremony included the entrance of their dogs in wedding attire. Truly a sweet, fun and serious in all the right places wedding! Congratulations to Emily and Ryan and their families! I’m so lucky to have such wonderful and capable musicians working with me. This past weekend was stacked up with weddings…literally. I had three weddings booked at about the same time in different parts of town on Saturday, Oct. 5. I was able to entrust two of the weddings to my colleagues who each reported back that their weddings went well. I wasn’t surprised at all knowing their ability. Jocelyn took care of a wedding at the Governor’s Club with a trio playing more traditional fare with the exception of the recessional for Bailey and Bryan. They tweaked their guests with “Brown Eyed Girl” for their trip back up the aisle as a married couple. Susan took care of Wilmarie and Steve’s wedding at CJ’s Off the Square. Their music was mostly contemporary with Wilmarie meeting her groom at the gazebo to “What a Wonderful World”. And everyone felt good as they recessed to “I Feel Good” (James Brown). You would have found me at the Stone Steps in Percy Warner Park at the end of Belle Meade Blvd. seeing that Eddie and Frankie were suitably married. This was one of the most relaxed weddings I’ve ever attended, entertaining the guests as they arrived with selections like “White Wedding” (no, it wasn’t a shotgun wedding) and “Your Song”. Their processionals and ceremony weren’t quite traditional beginning with both the mothers and wedding party entering to the theme from Forest Gump and then Frankie and Eddie processing down the aisle together to meet the officiant to Loreena McKinnett’s “Never Ending Road”. Frankie wore a lovely tea length dress and a crown of flowers….so apropos for the venue. We sent them off with “Don’t Stop Believin'”. Congratulations to all my brides and grooms of this past weekend. May you all have long and happy lives together! The weather cooperated yet again for the wedding of Caroline and Lee at the Carnton Plantation on September 28, 2013. Caroline was simply gorgeous as she walked down the aisle to the strains of Trumpet Voluntary on her father’s arm to meet Lee under the giant, spreading tree to the side of the mansion. Meredith Zeller of Bridal Blueprints, the wedding planner and coordinator, did a super job of making the festivities flow smoothly and effortlessly. Many wishes to Caroline and Lee for a long and happy life together! Tara and Sean were married at Belle Meade Plantation September 21, 2013 in the lovely, recently spiffed up area beyond the maze in back of the mansion. My favorite thing about this wedding was the music to which Sean’s bride came down the aisle….Sean’s own composition, which was dubbed Opus 98.6. Sean and Tara allowed me to choose their prelude music so I chose what I think are some of the most beautiful pieces in all the classical literature including the Faure “Pavane” and the Delibes “Flower Duet”. I soon found out that these pieces were favorites of others as well including one of the photographers. After the ceremony we reconvened at the Carriage House to play part of the reception. Cosmo Creations, a DJ service very kindly took care of our sound needs, piping our performance of contemporary pop and rock arrangements outside for the cocktail hour. What was very affirming was to have several guests upon entering the Carriage House come up to tell us they thought they were listening to cool recordings while they were outside. Congratulations to Tara and Sean and their families!